After graduating high school, I traveled south, college-bound, to a land where the "s" is silent. As a Wisconsinite in Illinois, my presence was somewhat of a novelty and I quickly discovered many of those native to the Land of Lincoln truly believed my state was some great wilderness…a frontier-land where everyone owns a cow and drives a tractor to work. I think few believed there was much of any civilization above the 43rd Parallel. So, to assist in the non-perpetuation of this notion, when people asked where I lived, despite my true home town, I would usually reply "Milwaukee"…both because it is the closest major city to where I lived and to show that, yes, Wisconsin actually HAS major cities. Surely a large city like Milwaukee would be geographically-evident to even the most die-hard of Bears fans… But I quickly learned this was not true. So, in an effort to familiarize my southern neighbors with the geography of my great state, I held open my right hand, palm facing them, with my fingers together and thumb out and said, "This is Wisconsin." I know the "mitten" analogy is probably the Intellectual Property of Michigan, but, Wisconsin is more akin to a hand with that mitten off, and this mechanic proved to be very helpful on more than one occasion. In fact, I got so good at its execution, I could point to all major cities on my hand, without looking, to give my friends a crash-course on the points of interest in Land of Cheese. I usually omitted the city of Green Bay, something I discovered helpful in not starting a debate on the "better football team," but one time someone asked, "What is the thumb?" I was actually surprised I didn't get that question more. Now that I think about it, I'm surprised I didn't volunteer that knowledge more! Looking at Wisconsin, it's a pretty major geographical feature! That thumb is also the reason for this post. Unlike the other posts on this blog, showcasing the lake itself, I'd like to, instead, showcase the land surrounded by the lake. The literal thumb of land, extending so gracefully into the heart of Lake Michigan that is beautifully affected by the water that surrounds it. That thumb gives me MY Lake Effect. That thumb is Door County. Back in the late 90s, my family decided to get in on the hottest real estate craze sweeping the country…timeshares. Remember those? While now known to be somewhat of a bad idea, there was one amazing thing that came out of our experimentation with it…one week in a beautiful three-bedroom place in Egg Harbor, WI. Looking back at your thumb…geographically, Door County takes up the majority of it, but its first real city doesn't appear until the knuckle joint. This is Sturgeon Bay, home of the Door County Maritime Museum and birthplace of countless boats and yachts in its many shipyards. It is the Door County seat and is, for all intents and purposes, a pretty traditional Midwestern town. 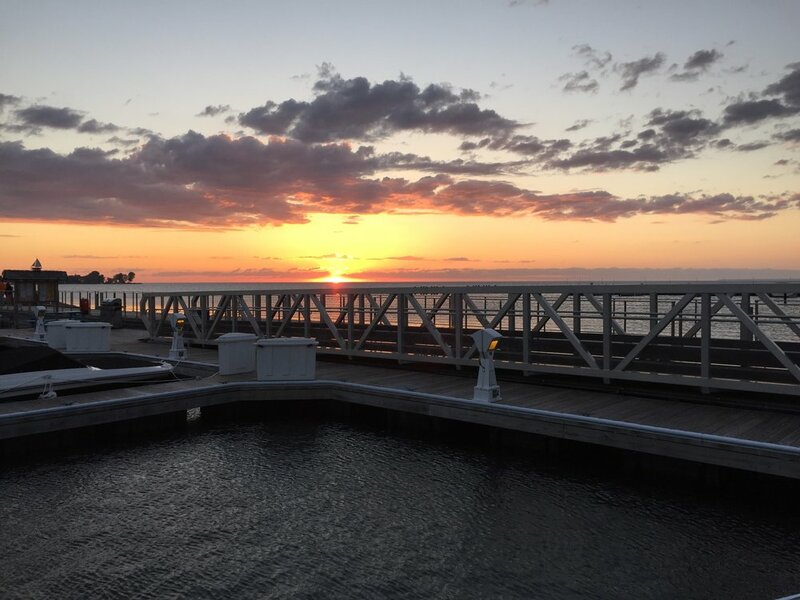 However, it is also known for something else…something very geographically important…it is the TRUE start of Door County…or, at least, MY Door County…the Door County I know and love. The city of Sturgeon Bay is split in half by a shipping channel with the two halves connected by a large drawbridge. My family has a rule. We leave all our cares and worries on the south side of that bridge (or maybe they just magically stay there?). Because, once we cross, we are in a whole new world…one that is free from stresses, obligations, and timetables. A place where our only worry is whether we'll make the sunset in time and the only decision I have to make is "red or white?" North of here, we are officially on vacation. Everything is different. In fact, north of this point, the county even has an ordinance prohibiting chain retailers and restaurants from setting up shop to maintain the charm and integrity that is the Northern Door (Nor-Door). Up here, the way of life is slower and so much more relaxed. You know you're on vacation! 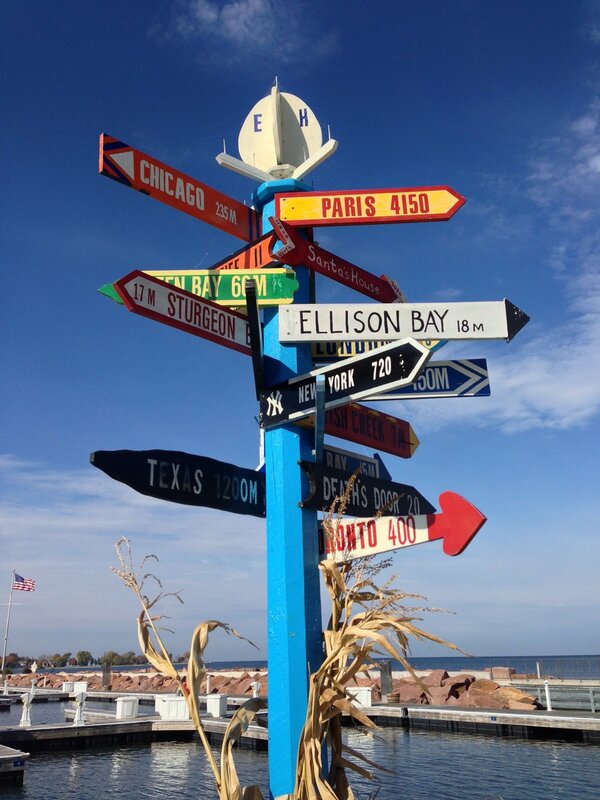 And once we cross that bridge, our next stop is Egg Harbor…my home base. Situated somewhere in line with the thumb's nail bed, it is the first of four ultra-quaint and picturesque towns settled into the sheltered bays of the peninsula's western side. 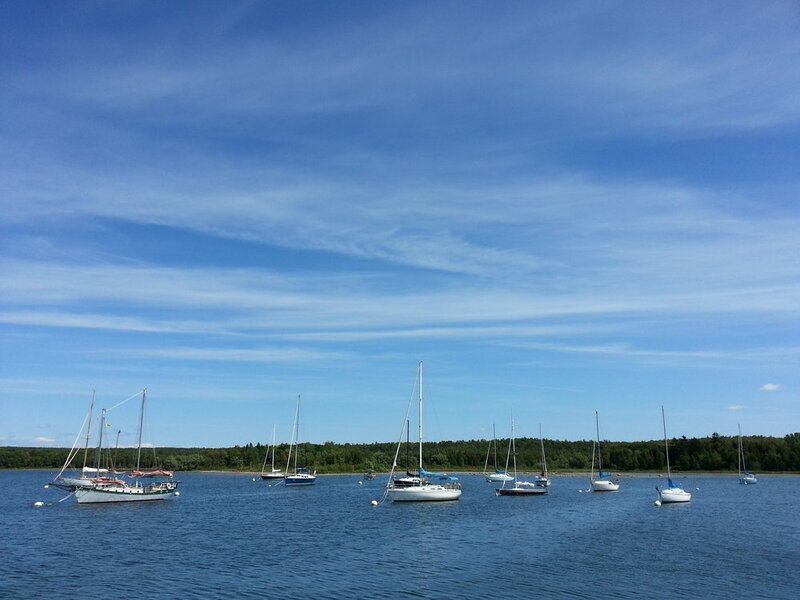 Egg Harbor’s peculiar name dates back to its founders and an improvised rowing race they had in its bay. In an effort to thwart the opposing team from reaching the shore first, each row boat comically pelted the other with eggs, leaving the shore riddled with egg shells the next morning and a fun name for their new city. That whimsically nautical spirit remains today…and everything in the town is inspired by it right down to the local beer, Shipwrecked. One of my favorite things about Door County is the diverse level of activities it contains. Unlike some northern vacation spots, Nor-Door allows its visitors to choose their own level of interaction with it. Want to feel like you're relaxing in a secluded lake cabin for the weekend? Get ready to channel your inner-Thoreau. Need to experience the adrenaline rush of kayaking through sea caves carved out by cliff-pelting waves? Hook up the GoPro! Want to change for dinner and visit a delightful dock-side restaurant? Bon Appetite! Like to shop till you drop? Just bring a big enough trunk! As a visitor here, you are in the front seat of a choose your own adventure novel, the beauty of which is you will never have to settle on one thing…a perk I truly enjoy exercising whenever I visit. Despite this, I feel like there are a few definite things that embody the epitome of my best times in Door County. At the top of that list is an Egg Harbor sunset. There are few things in life that bring me true peace. I live in a major metropolitan area and deal with both physical and mental congestion every day. In an urban environment, peace just doesn't come around that much…and sometimes it's hard to image anything outside of that world. But when I am up in Door County, all of that is forgotten…and there is no easier way to forget about it than when the sun starts to get within a finger's-length of the western skyline. Sunsets in Door County are somewhat of a religious experience for me. When that big orange, fiery ball melts so beautifully into the navy blue of an unobstructed horizon, producing an ever-changing array of colors, I melt right along with it and, at that moment, anything seems possible. The experience is the very essence of peace. And of all the peninsula's sunsets, I feel Egg Harbor does it best. The natural, semi-protected bay produces a beautiful panorama bookended by a cape to the south and two islands to the north. It's almost like God planned the entire set for this very experience and we get to watch from orchestra-center on the shoulders of a large-bouldered harbor. This is the closest to Heaven on Earth I can get, and I love it! Another thing Egg Harbor does really well is "community." Everyone is your neighbor and the whole town is filled with friendly, helpful people eager to make any visitor feel welcome. Just recently the city started a bike-share program! For no fee at all, anyone can park at Main Street Market, the local grocery store, and use a beautiful new, and comfortable, bike for as short or long of a period as they'd like to! During my last trip, I took a wonderful ride along a coastal back-road and explored parts of the peninsula I'd never seen before…the whole time, receiving waves from locals as I passed their beautiful homes. They are as eager to share the beauty of their land as I am to see it, and for the brief time I visit, I, myself, feel at home. Just north of Egg Harbor is the second of the four western towns, Fish Creek. 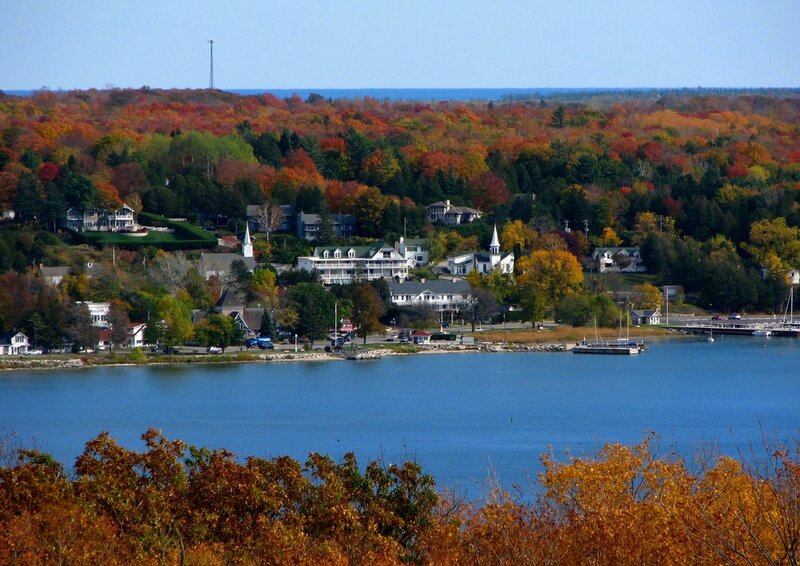 Best known for its shopping scene and fish boils, the town also boasts an impressive bluff-view of Green Bay when driving in from the south, courtesy of the Niagara Escarpment. This bluff is the edge of a vast sedimentary rock layer, exposed by glaciers, and is the same edge Niagara Falls flows over 1,000 miles away. It is also the reason for the Great Lakes’ (and Door County's) existence…and while this is impressive, I come here for something even better! Pizza! Despite Boston holding the record for my Number One favorite pizza (Pizzeria Regina), my second favorite pizza in the world is in Fish Creek at a tiny hole-in-the-wall place called Wild Tomato…and they make a damn good pie. Set up as one of those places where the capacity doubles in the warmer months due to patio seating, Wild Tomato makes all of their pizzas in a large, wood-fired, brick oven. …and when one comes out, it looks like it could be on the cover of any food magazine. Their dough, in my opinion, makes the pilgrimage worth it. It has the perfect combination of a crunchy outside, firm enough to hold all the toppings you'd want, with a soft chewy inside, melting into your taste buds with the flavor you'd expect from the pizza of your dreams. Writing this, my stomach is actually growling. And every week they make a unique, specially-topped pizza whose profits all go to charity. 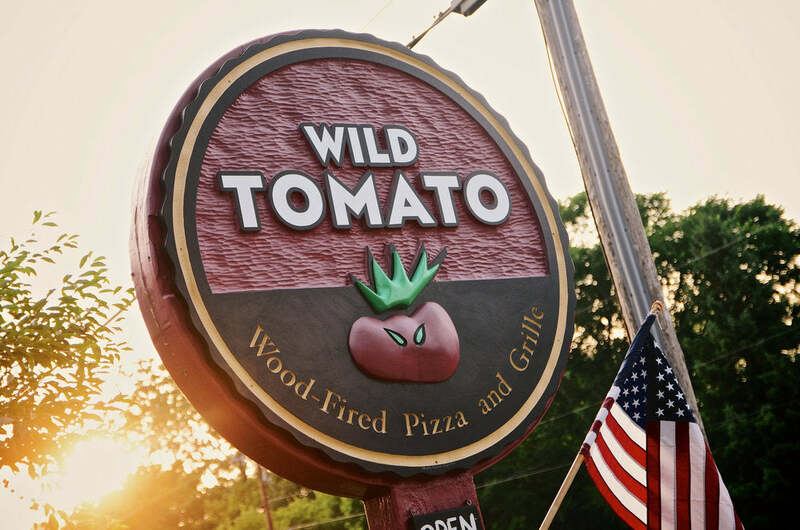 The only bad thing about Wild Tomato is they don't deliver to the Milwaukee area…so we make sure to satiate our cravings while there. Try it. I promise you won't be disappointed! A short drive north of Fish Creek on Hwy 42 brings us to Ephraim, and probably the most picturesque of all these lake towns. 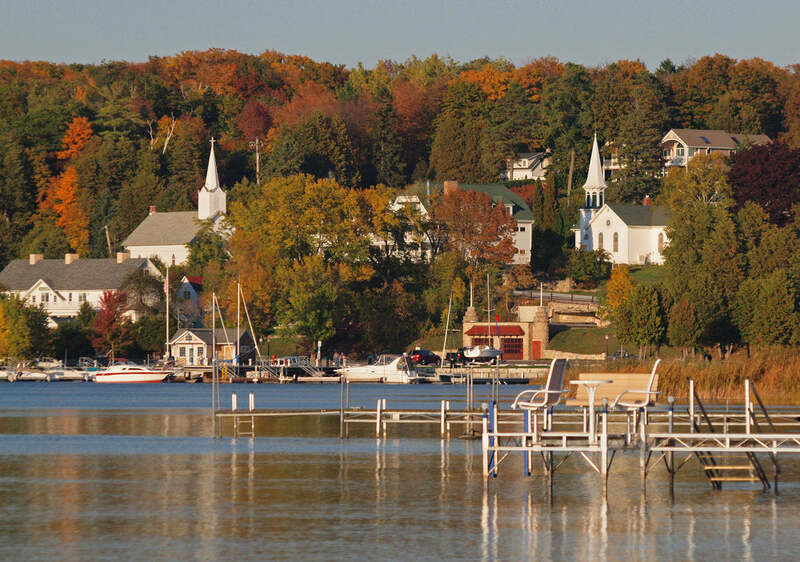 The city hugs the shore of a large bay just north of Peninsula State Park, complete with harbor parks, quaint church steeples, old shops, and Wilson's…a Norman-Rockwell-esque ice cream parlor, complete with a red and white-striped awning and lake-side patio seating. I have been indulging in frozen desserts here since I was a kid…and now that I am an adult, enjoying one of their 20 flavors makes me feel like one again. I don't think there is anything special about the ice cream, per se, but the view always seems to make it taste better! Plus, every home made waffle cone gets a jelly bean in the bottom so that, as the ice cream melts, dripping is minimized from the bottom. It's a small, efficient, and fun way to stop an age-old problem and leaves any patron childishly excited to see if the bean's flavor will be one of their favorites. To this day, my family will do the same when we serve cones at home! The best part about Wilson's location is, after renting a kayak or paddleboard in Ephraim Bay, I can easily treat myself to a "post-workout" "snack"…and keep my equilibrium in line. The final "major" town on the western side of the peninsula is Sister Bay. 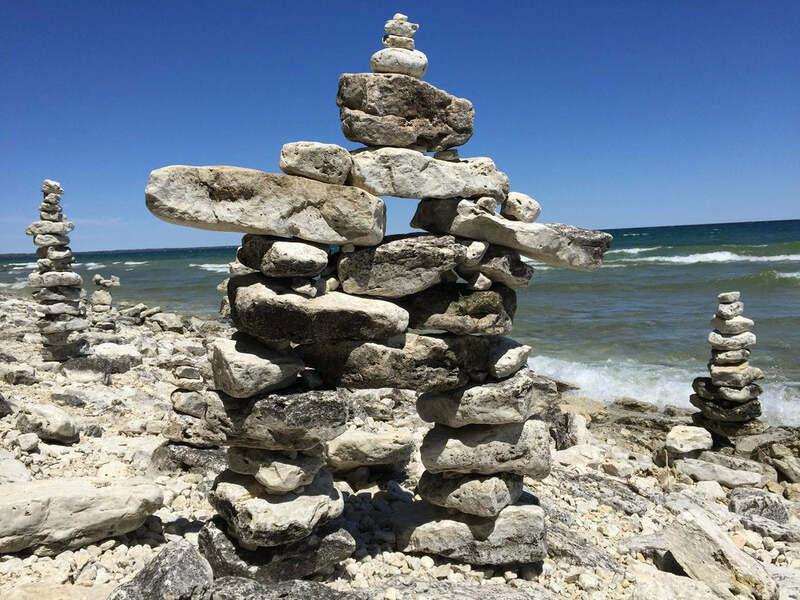 Door County was originally settled by Nordic immigrants and nowhere else does that cultural influence shine brighter than here. The whole city looks like it was imported right from a Swedish village...and if the architecture doesn't give it away, the Swedish flags flying everywhere will! Sister Bay is home to the famous (and touristy) Al Johnson's restaurant. Despite being a "restaurant" by name, it is actually more akin to a mini Ikea, complete with a Swedish grocery store, gift shop, clothing store, post office, and, of course, restaurant. 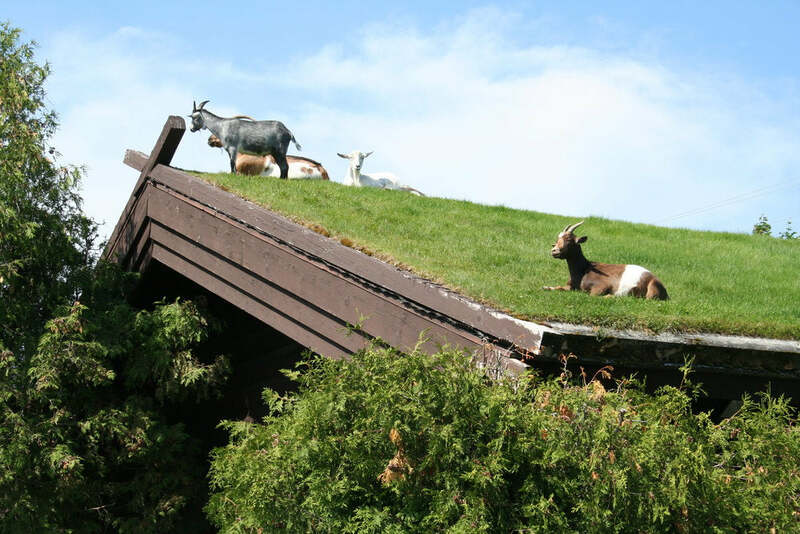 Oh…and there is a farm on the roof. …Yep! You read that right. The roof of Al Johnson's restaurant is a mini farm. Rather than shingles, it is covered in wild grass. How do they maintain this grass from getting too long, you ask? Why with goats, of course! I promise, you can't make this stuff up! If you're lucky, you'll see a few of them up there, eating the grass, and posing for pictures for the people below. 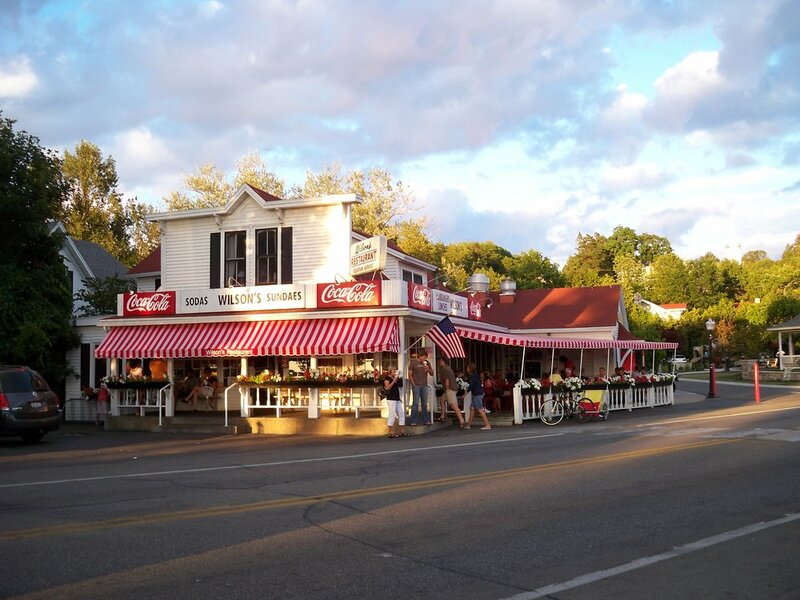 If you don't want to go the "full tourist route," I'd say don't eat at Al Johnson's…just visit for the experience…then walk two blocks south to Door County Creamery to satisfy your hunger pangs and taste the magic those goats can make! Inside, there is a beautiful assortment of Caprine dairy products, ranging from savory to sweet. On one of my last trips, I purchased a delicious Pimento Chevre and freshly-baked baguette, and walked right outside to Lakeside Park to eat it while watching the waves roll in from the north…and then, right on the pier, played a mean game of Bananagrams I purchased for $3 from a thrift shop across the road. 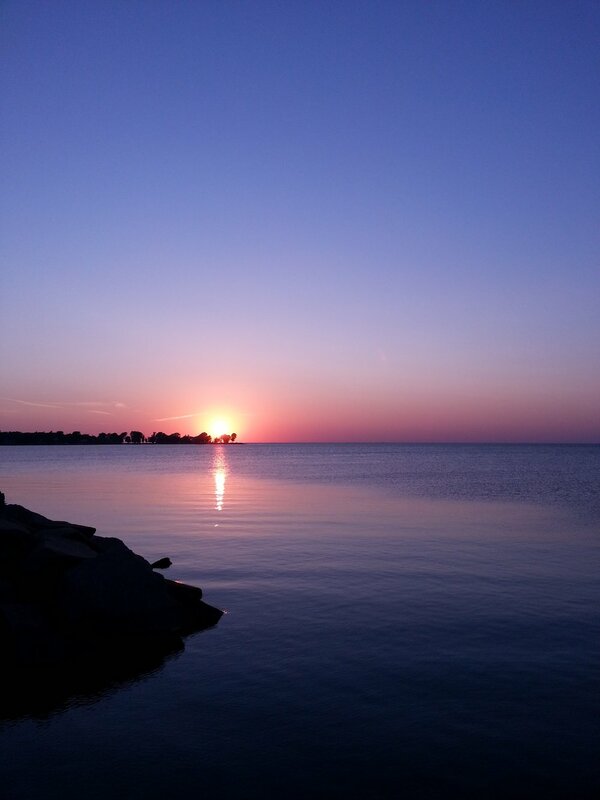 This is the beauty of Door County. Everything can be done on a whim…and nobody faults you for it. Here you can be who you want to be and do what you want to do when you want to do it. 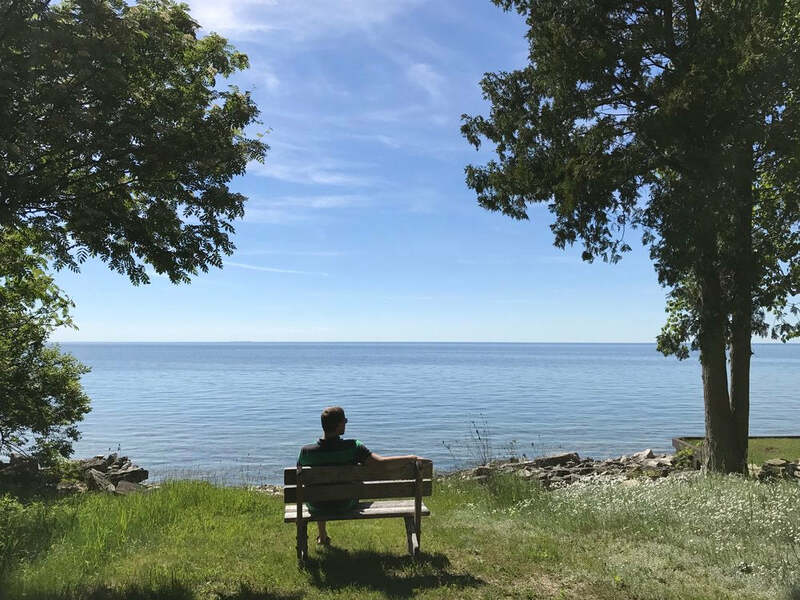 While the western side of the peninsula has quaint towns and much more civilization, the eastern, Lake Michigan side of Door County is the complete opposite with an unpopulated rustic and natural beauty. For me, no trip up here would be complete without a visit to Cave Point County Park just south of Jacksonport. 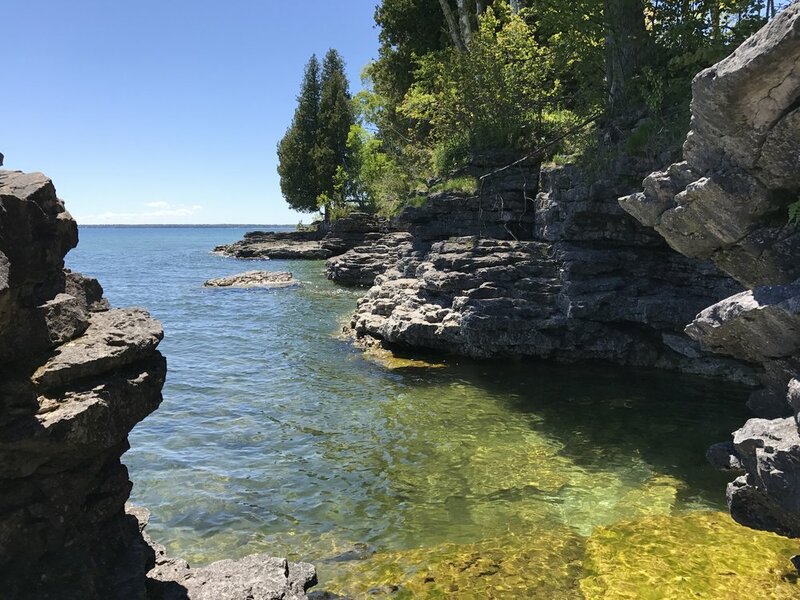 Here, the waves of Lake Michigan carved cave-like inlets into the limestone cliffs of the Niagara Escarpment…and their beauty could not be more breathtaking. Standing on the edge, you can hear and feel the bass of the waves crashing against the bluffs below you…and the daring of us can actually climb out onto the fallen, truck-sized boulders jutting out into the lake. Unlike State Parks, Cave Point has free admission and, if climbing or spelunking isn't your thing, it is also the perfect place for a picnic or some mild hiking. The north end of the park has a vast, rocky beach, filled with numerous flat stones. Here people have taken it upon themselves to build a network of Inuksuits, or Inuit-style land markers. The entire beach is filled with these structures and they provide amazing photo opportunities along with the ability to get your inner-Lego-enthusiast on…I know I have on many occasions! Despite the abundance of things to DO in Door County, I always enjoy the explicit permission it gives me to DO NOTHING. The times when reading a book on the pier or playing a game of cards with my family is encouraged. Where sitting in the hot tub for an hour or opening a bottle of wine at 2 or 3 in the afternoon brings no feelings of guilt. Crosswords and magazines and napping and doing other things we don't allow ourselves to do back home. Sleep in until 10? Why not make it 11? I am on vacation! I can do whatever I want! The peninsula said so. Because up here, we don't worry about our next meeting or picking up kids from soccer practice. We don't worry about what others think. We are free to be ourselves. We are free to go native…however that may come about. This is healthy. Door County is one of my favorite places. From the beauty of the lake to the charm of the towns drawing their spirits from it. From the diverse choices of activities to the realization I can do absolutely nothing but relax. This place suits me. Over the years, it has renewed me in so many positive ways and I always look forward to and enjoy the time I spend with it…and I know my family does as well. After purchasing the one timeshare, we now have four of them. For one full month each year, I am blessed to experience everything the peninsula has to offer…and the best part is, it is so accessible. After leaving work on a Friday afternoon and a brief three-hour drive north, I am half-way through a beer, and fresh on the start of a wonderful vacation...with all my stresses and worries left behind. They can't get me up here. The Lake Effect makes me immune! To me, that is the best vacation ever!